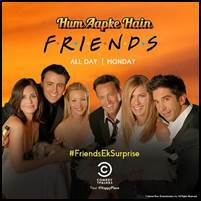 National, Monday, April 1, 2019: Prepare to LOL, LMAO, LMFAO, ROFL and even ROFLMAO, as COMEDY CENTRAL celebrates April Fool’s Day with the best of F.R.I.E.N.D.S in a way never seen before. 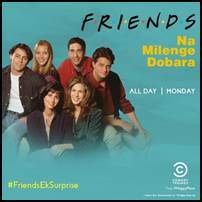 Crafting an insane laughter riot, starting 6 am, COMEDY CENTRAL airs the world’s highest-rated sitcom in a new avatar, with one character in every episode speaking in the conspicuous voice of a prominent Bollywood personality, that too in Hindi. 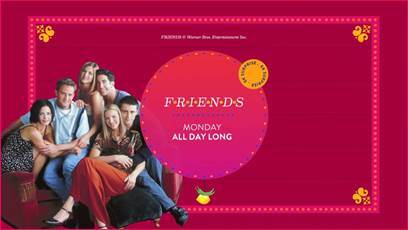 So, buckle up and binge on this wild marathon as Rachel, Monica, Phoebe, Ross, Chandler, and Joey find their voice with much gusto from some of the most iconic stars of Bollywood including Sonam Kapoor, Kajol, Kangana, Amitabh Bachchan, Saif Ali Khan and Shah Rukh Khan in this string of rib-tickling episodes. 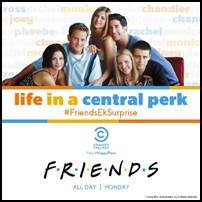 Comedy Central India launched in 2012, lines up powerful programming including hit TV series such as Friends, Anger Management, Episodes, Saturday Night Live, Whitney, The Office, Seinfeld, Frasier, That 70s Show, South Park and Suits. The country’s first 24-hour channel dedicated to English language comedy, Comedy Central is available in over 27 million households across the country and across analogue, digital cable & DTH. Since late 2006, Comedy Central has expanded globally with localized channels in Poland, Germany, Netherlands, Italy, Hungary, Sweden, Ireland, United Kingdom, New Zealand, Israel Spain & Singapore. Viacom18 Media Pvt. Ltd. is one of India’s fastest growing entertainment networks and a house of iconic brands that offers multi-platform, multi-generational and multicultural brand experiences. A joint venture of TV18, which owns 51%, and Viacom Inc., with a 49% stake, Viacom18 defines entertainment in India by touching the lives of people through its properties on air, online, on ground, in shop, and through cinema.